Can't you tell I love peas? Like many of you I love Pinterest and it's infinite amount of recipe pins so of course I couldn't resist trying out this easy salmon recipe. I wanted to test out this recipe on my day off to see how "easy" it really was and I have to say it was right on! Thaw out your salmon; I bought them individually wrapped so they're easy to toss a few in a bowl on the bottom shelf of the fridge to thaw out while you're at work or during the day. While you're prepping preheat the oven to 300 degrees. Place a few pieces of butter on top of the salmon. Sprinkle pepper on top plus any other seasonings of choice. Create a pocket with the aluminum foil by pulling two sides together, fold over, then close the sides in with the center fold. It tasted great and clean up (including prep) was a breeze because everything was contained in the aluminum foil pocket. Next time though I might use a bit more pepper and another spice to give it additional flavor. Overall it's an easy tasty dinner perfect for two that you won't break a sweat over! Yum. My stepdad does a killer salmon on the grill. 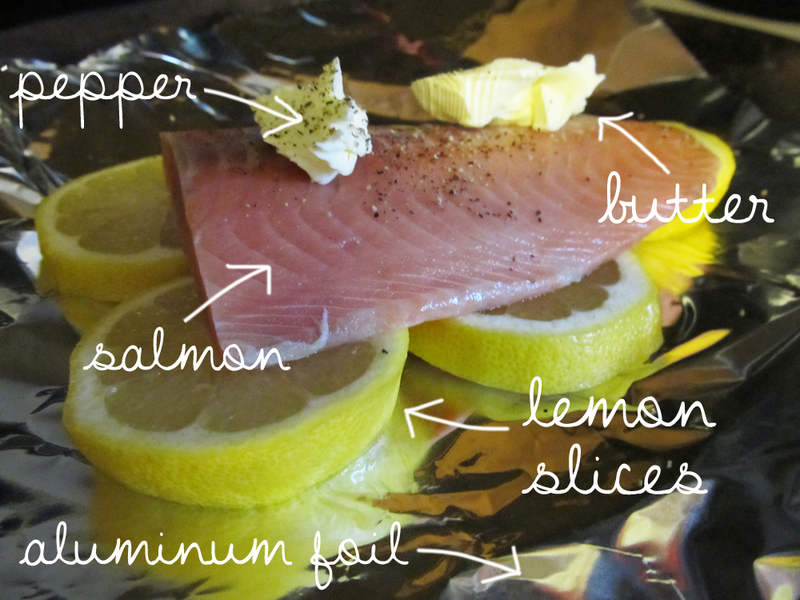 Foil, then your salmon, cover with italian dressing, tomatoe and lemon slices. Perfection. Super, now I'm hungry.